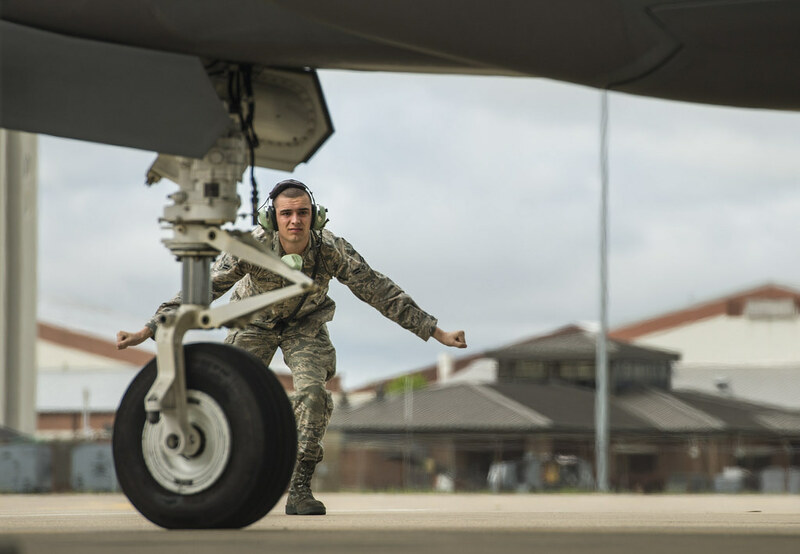 Next-generation fighter jets, simulated aerial combat and some of the best pilots from the U.S., British and French air forces – no, this isn’t a scene from the next Hollywood blockbuster. 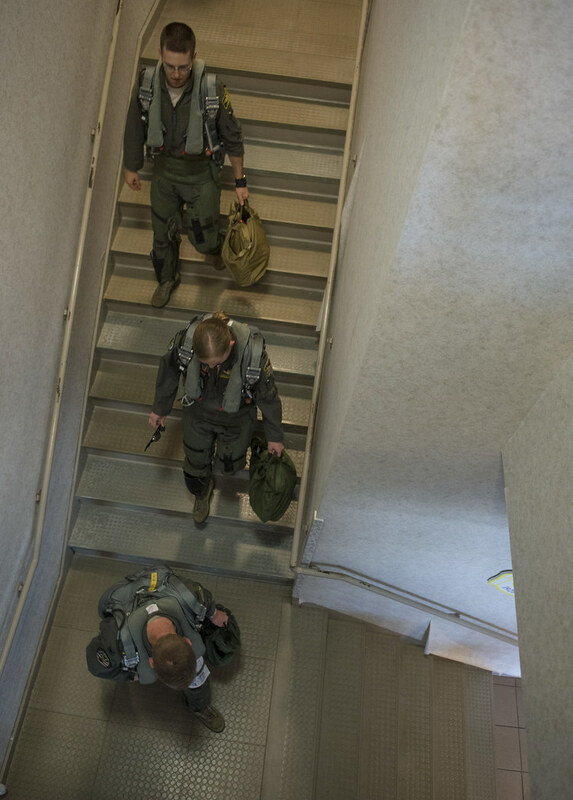 It’s the latest combined exercise testing pilots’ ability to operate, communicate and dominate in a combat environment. 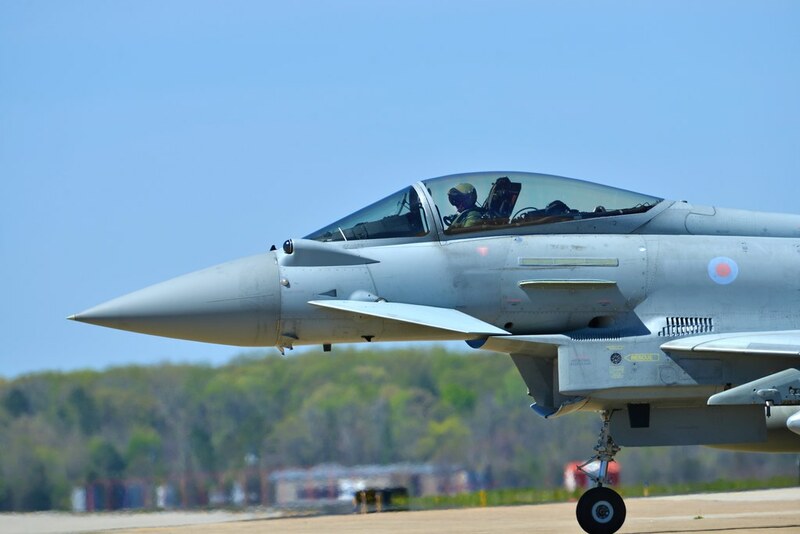 Called “Atlantic Trident,” this month-long exercise at Joint Base Langley-Eustis, Virginia, focused on anti-access and aerial-denial missions, which were meant to place the U.S., British and French pilots in situations that tested their limits and capabilities. 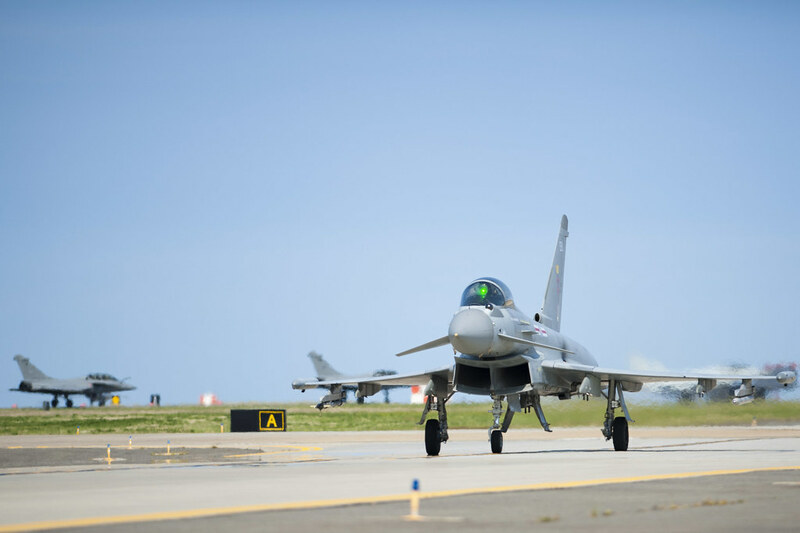 The advanced aircraft participating included the F-22 Raptor, the F-35 Lightning II, the Eurofighter Typhoon and the Dassault Rafale – all of which bring a lot of capabilities to the fight. 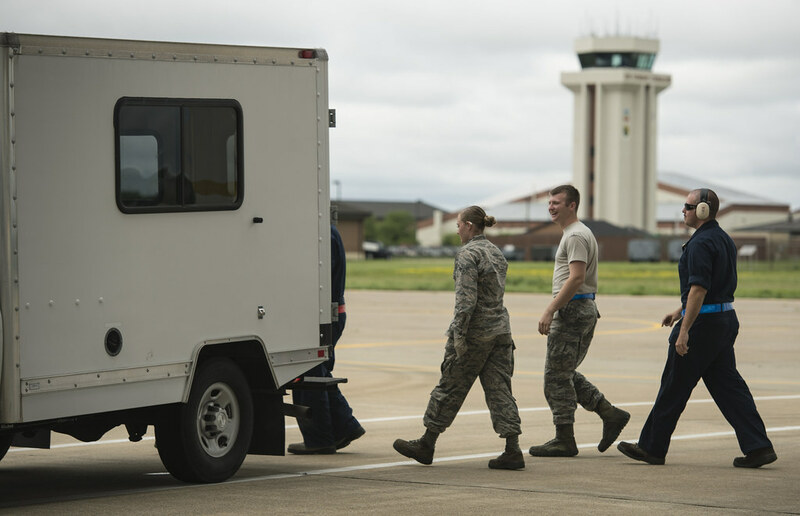 The aircraft were supported by USAF Air Combat Command E-3 Sentry airborne early warning and control aircraft and Air Mobility Command KC-10 Extender refueling aircraft. 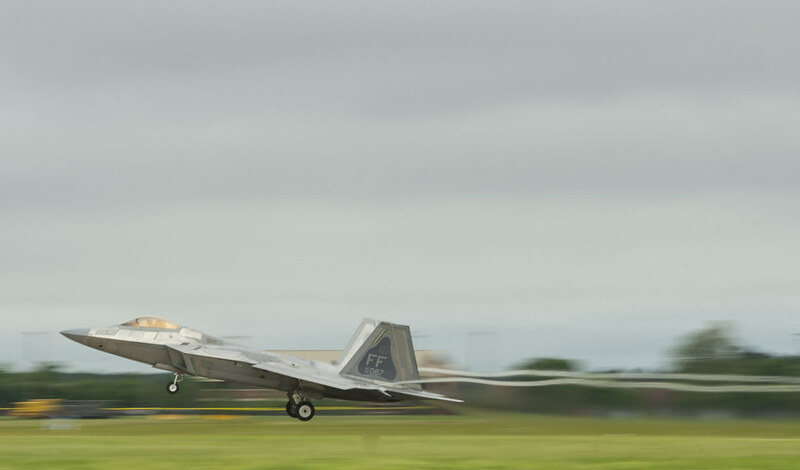 An F-22 Raptor from Eglin Air Force Base, Florida, prepares to take off from the Joint Base Langley-Eustis, Virginia, flight line April 26, 2017, during exercise Atlantic Trident. 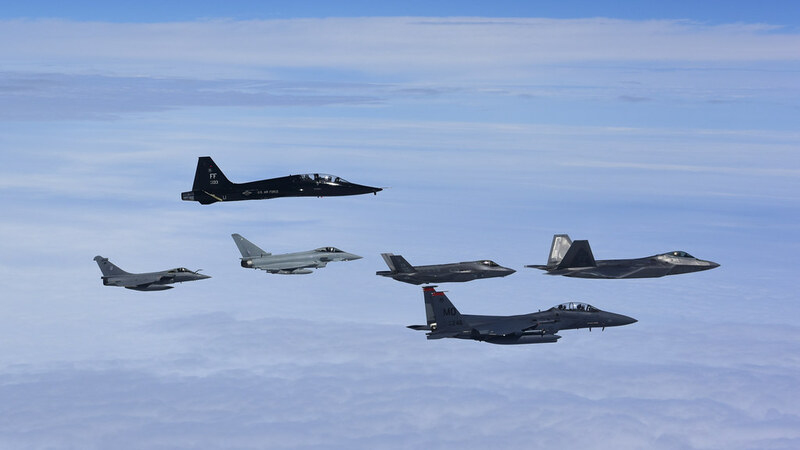 The exercise, which included aircraft from Great Britain and France, tested interoperability through combined coalition aerial campaigns. Approximately 225 Air Force, 175 Royal Air Force and 150 French Air Force service members participated in the exercise. Photo // Tech Sgt. Vernon Young Jr. According to Lockheed Martin, the Raptor’s unique combination of advanced stealth, supercruise, advanced maneuverability and integrated avionics allow it to “kick down the door,” and then follow up with 24-hour stealth operations and freedom of movement for all follow-on forces – fully leveraging the Raptor’s technological advantages. The F-35, meanwhile, is no slouch, either. 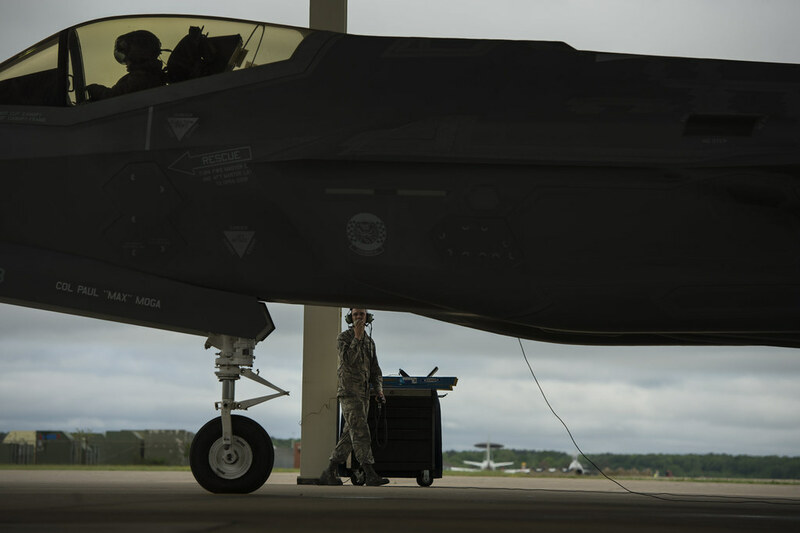 The F-35 combines fifth generation fighter aircraft characteristics — advanced stealth, integrated avionics, sensor fusion and superior logistics support — with the most powerful and comprehensive integrated sensor package of any fighter aircraft in history. This means the Lightning II can collect and share battlespace data with other friendly aircraft and commanders on the ground and at sea. 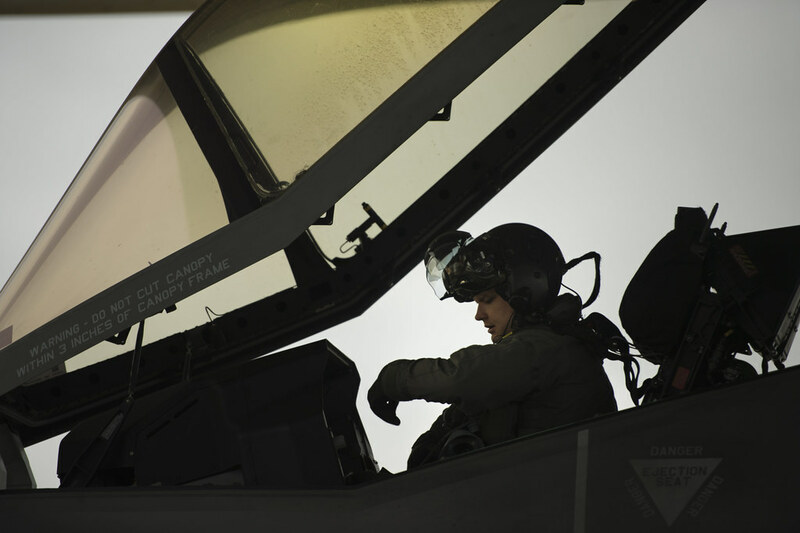 “The F-35 brings an unprecedented combination of lethality, survivability and adaptability to joint and combined operations,” said Maj. Mike Krestyn, an F-35 pilot with the 33rd Fighter Wing at Eglin Air Force Base, Florida. Capt. 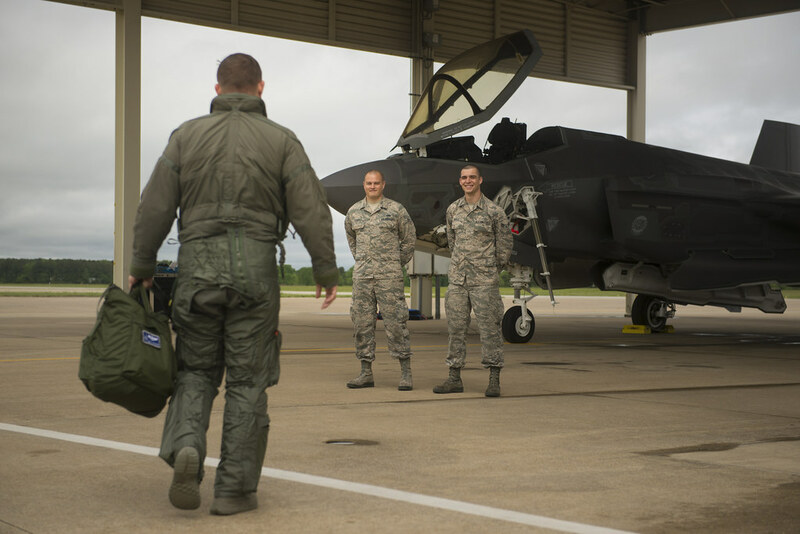 Joshua Gradaille, 58th Aircraft Maintenance Unit, aircraft, personnel and equipment officer in charge, Eglin Air Force Base, Florida, greets Maj. Michael Krestyn, an F-35 Lightning pilot, 33rd Fighter Wing, Eglin Air Force Base, Florida, landing at the Joint Base Langley-Eustis, Virginia, April 26, 2017, during Atlantic Trident 2017. The exercise, which included aircraft from Great Britain and France, tested interoperability through combined coalition aerial campaigns. Approximately 225 Air Force, 175 Royal Air Force and 150 French Air Force service members participated in the exercise. Pilots of both the F-22 and F-35 refer to their jets as aerial “quarterbacks,” capable of controlling an airspace by locating, identifying and sharing the location of enemy threats within a battlespace. Then, allied aircraft like the Typhoon and Rafale can use their advanced weaponry to eliminate these threats. 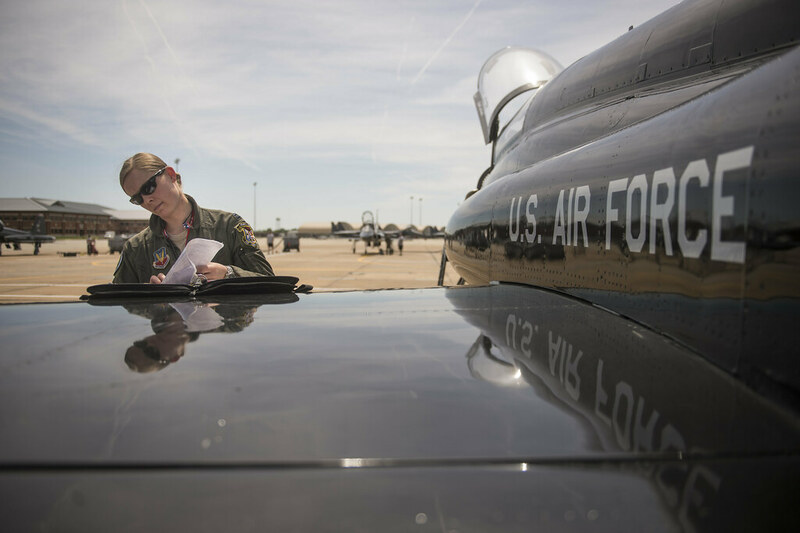 All of these advanced aircraft provide lethality never before seen in aerial combat, and their pilots training and flying together enhances tactics, ensures coalition teams are on the same page and strengthens relationships. But, none of these capabilities mean anything without one crucial component. 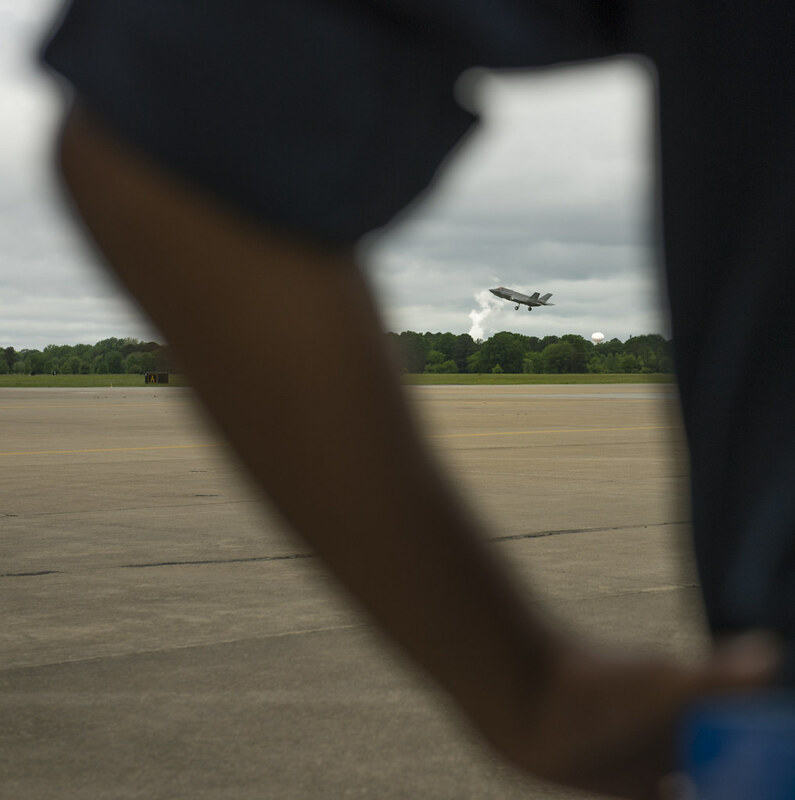 It’s easy to get distracted by the sleek aircraft and their state-of-the-art capabilities, but this shouldn’t take away from how important the human element still is to air operations, he added. Capt. 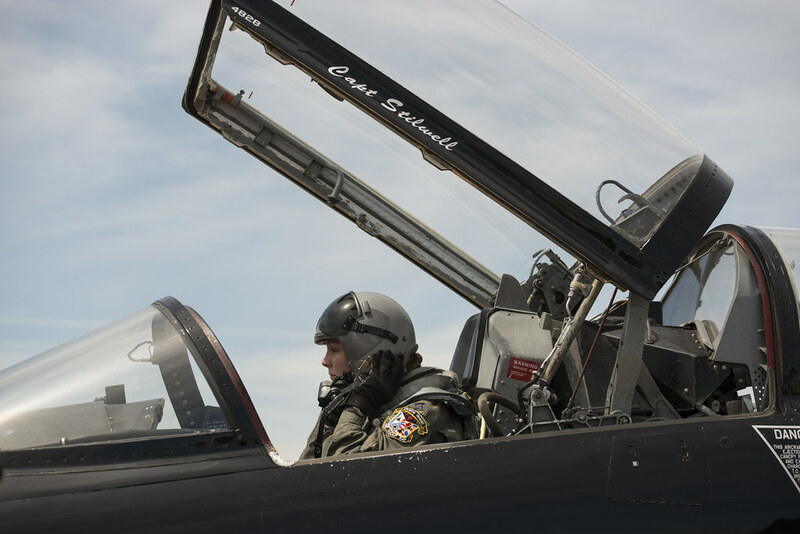 Nichole Stilwell, a T-38 Talon pilot with the 71st Fighter Training Squadron, performs a pre-flight check during Atlantic Trident 2017 at Joint Base Langley-Eustis, Virginia, April 27, 2017. The exercise, which included aircraft from Great Britain and France, tested interoperability through combined coalition aerial campaigns. 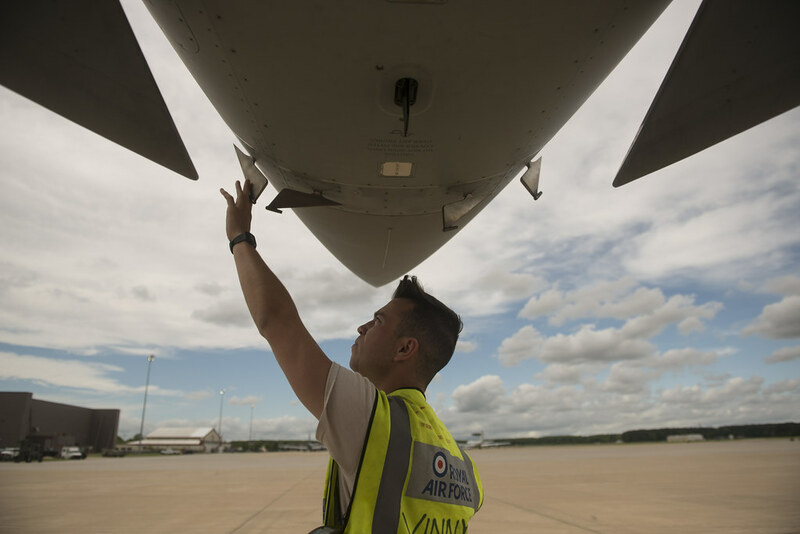 Approximately 225 Air Force, 175 Royal Air Force and 150 French Air Force service members participated in the exercise. So, exercises like this are really all about people – training them, developing them, testing them – and relationship building, he added. 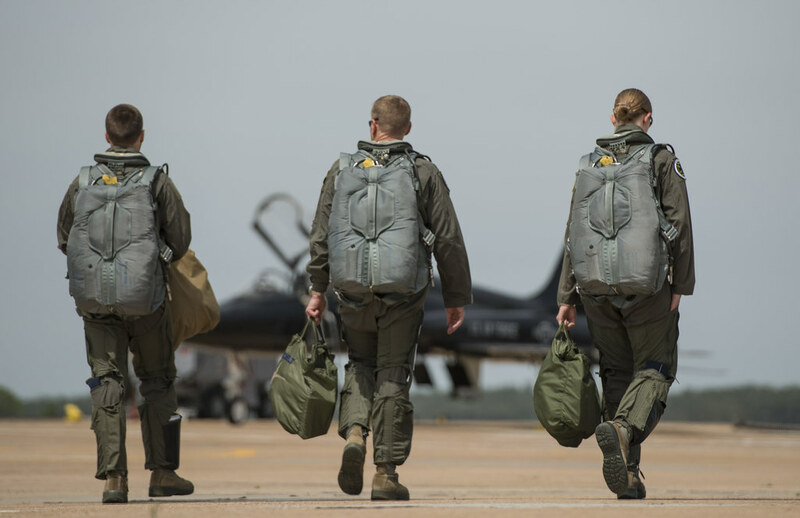 Throughout the exercise, U.S., British and French pilots planned, flew and evaluated missions together, working side-by-side to develop tactics and talk about lessons learned from each day’s flights. 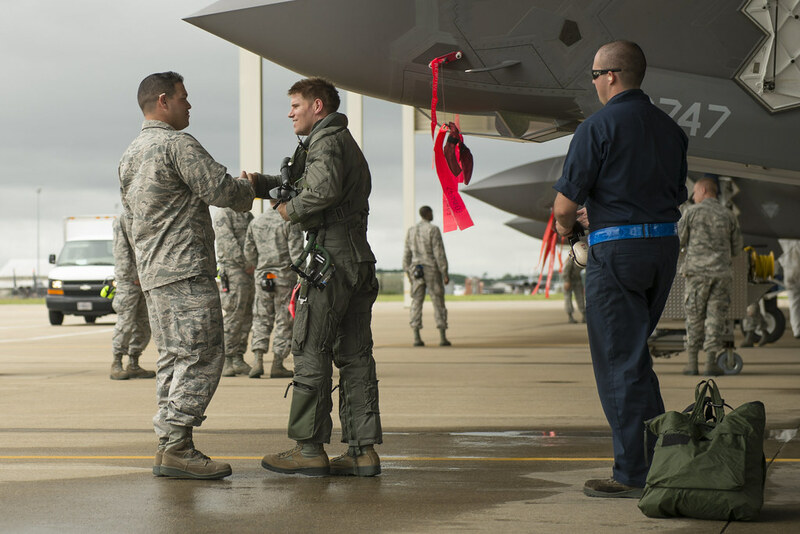 Airman 1st Class Travis Boyle, an F-35 Lightning II crew chief with the 58th Aircraft Maintenance Unit at Eglin Air Force Base, Florida, communicates with Maj. Darren "Decoy" Woodside, an F-35 pilot with the 33rd Fighter Wing, Eglin Air Force Base, Florida during pre-flight checks prior to takeoff during Atlantic Trident 2017 at Joint Base Langley-Eustis, Virginia, April 26, 2017. The exercise, which included aircraft from Great Britain and France, tested interoperability through combined coalition aerial campaigns. Approximately 225 Air Force, 175 Royal Air Force and 150 French Air Force service members participated in the exercise. These bonds and friendships made at Atlantic Trident can also carry over into other operations. 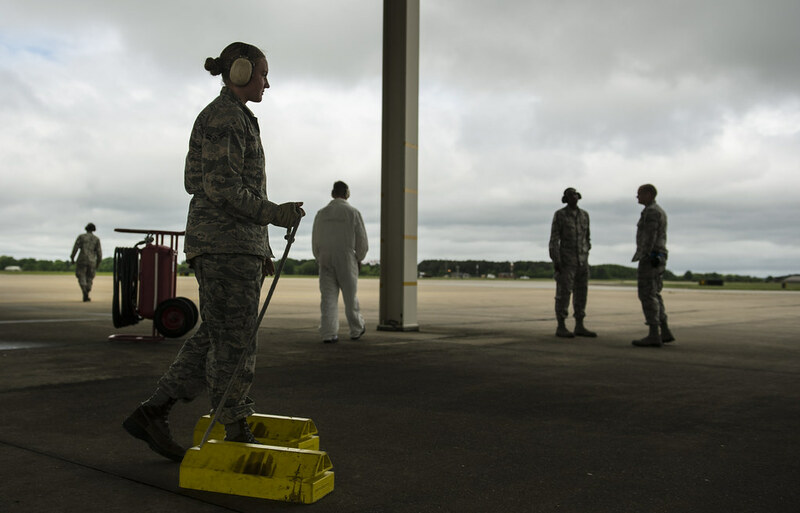 Still, as pilots of each aircraft are quick to point out, a conversation about people can’t happen without talking about maintainers. This sentiment is echoed by Hoyle. Once these advanced fighters do get in the air, testing them and their pilots is still important. This is where the adversary squadrons come in. Made up of T-38s from Langley and F-15E Strike Eagles from Mountain Home Air Force Base, Idaho, these “adversaries” acted as enemy combatants during the exercise to test friendly force’s air-to-air abilities. Flying outdated, past-their-prime trainer jets against the most technologically superior fighters in the world may seem futile, but the adversary pilots have a different outlook. At the end of the day, though, exercises like Atlantic Trident do more than give pilots time behind the stick. 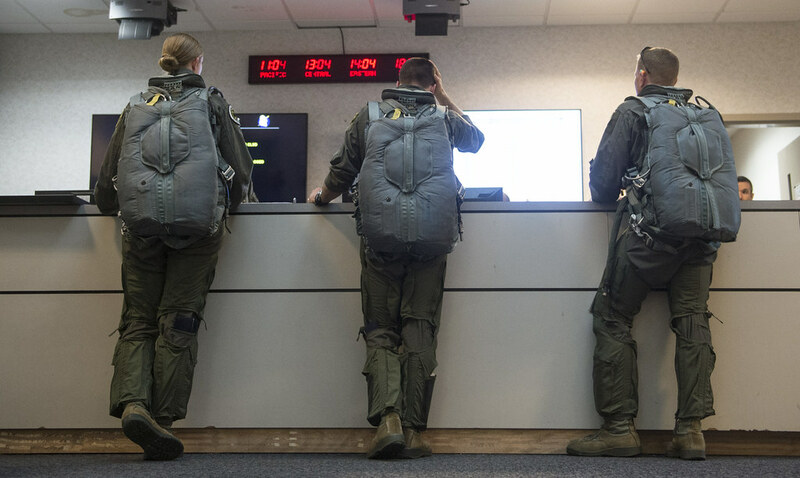 These exercises are providing relevant, realistic training so that when pilots do experience stressful combat situations for the first time, they are prepared. French air force and Royal air force Airmen attempt to gain control of a soccer ball during the ATLANTIC TRIDENT 17 soccer tournament, at Joint Base Langley-Eustis, Va., April 22, 2017. 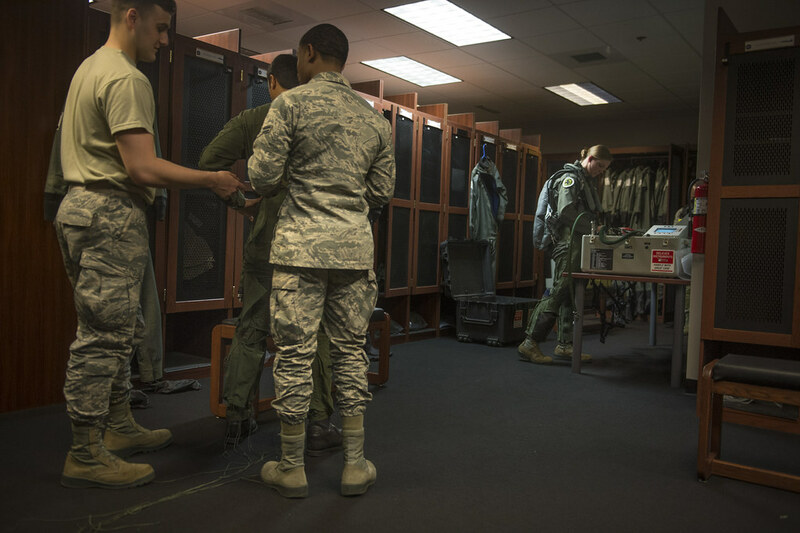 While the exercise is intended to share and develop training, tactics and procedures to enable interoperability, the Airmen from the U.S. Air Force, FAF and RAF found themselves gathering together off-duty to interact and learn more about each other. Air superiority doesn’t just mean having the most technologically sophisticated aircraft in the world. It also means having highly trained and experienced pilots to fly them. Working together also helps each of the players learn to speak the same language – that of winning. 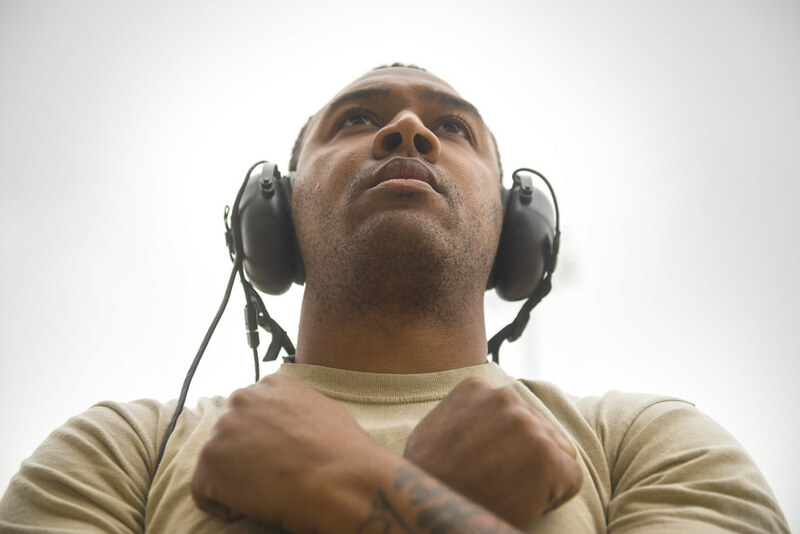 “Really, the goal of exercises like this is to train and learn together so that on day one of a future conflict, we dominate,” Fesler said.  Archived in Operational, Training. Bookmark the permalink.